On March 27, 2013 MIFTAH, a Palestinian non-governmental organization (NGO) founded in 1998 by Hanan Ashrawi (Chair of MIFTAH’s Board of Directors), published an article by Nawaf al-Zaru that repeated the antisemitic blood libel.1 He wrote, “Does Obama in fact know the relationship, for example, between ‘Passover’ and ‘Christian blood’… ?! Or ‘Passover’ and ‘Jewish blood rituals…?! Much of the historical stories and tales about Jewish blood rituals in Europe are based on real rituals and are not false as they claim; the Jews used the blood of Christians in the Jewish Passover …” (translated from the original Arabic by NGO Monitor). MIFTAH’s funders enable the NGO’s activities and give the organization significant impact, and thus bear considerable responsibility. Funders in 2011 (the latest available report) include the EU (via the Anna Lindh Foundation), NGO Development Center (joint funding from Switzerland, Sweden, Denmark, and the Netherlands), Italy, Austria, Heinrich Boell Stiftung (German government funding), Konrad Adenauer Stiftung (German government funding), Ireland, Norway, and indirect U.S. government funding via National Endowment for Democracy and International Republican Institute. Between 2007 and 2012, the National Endowment for Democracy (U.S.) provided $178,740 to MIFTAH, according to the NGO’s financial reports and documents provided to NGO Monitor by NED (2007, 2008, 2009, 2010, 2012). This case is not unique – other Palestinian NGOs funded by European governments have published overtly antisemitic material. 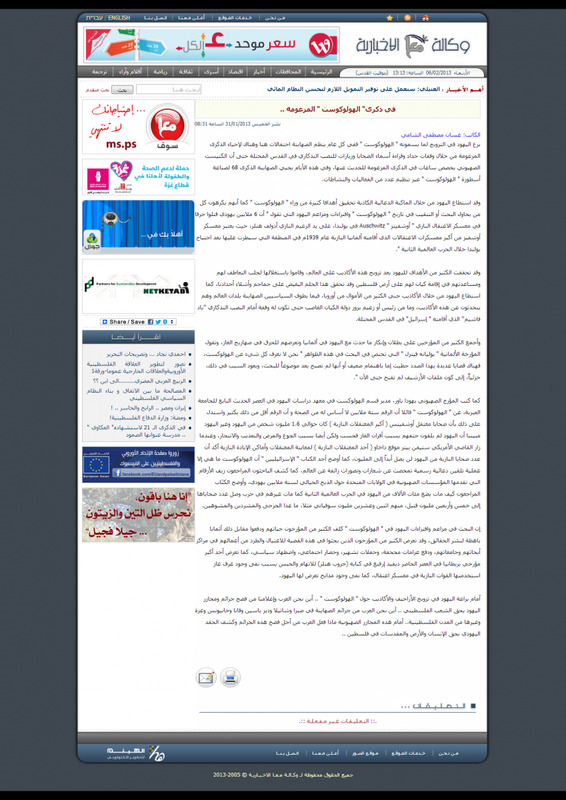 For example, the Palestinian Ma’an News Agency published an article denying the Holocaust (January 31, 2013). The article was taken down only after public exposure and scrutiny. The Ma’an News Agency is an online news project of Ma’an Network, which receives funding from the EU, the Netherlands, Denmark, U.S. Middle East Partnership Initiative, UK, United Nations Development Programme (UNDP), and the United Nations Educational, Scientific and Cultural Organization (UNESCO). The MIFTAH article was highlighted by blogger Elder of Ziyon, and received considerable attention on blogs, Twitter, and other online platforms. On March 31, the Anti-Defamation League and the Simon Wiesenthal Center condemned the article, expressing dismay that MIFTAH had yet to apologize. MIFTAH’s website also includes the glorification of terrorism in an article by Johorah Baker titled “Palestinian Women and the Intifada” (July 5, 2006). Under the sub-heading “Fighting Back,” Baker describes how Palestinian women “also decided to join the ranks of the resistance movement.” The article cites suicide bomber Wafa Idrees as “the beginning of a string of Palestinian women dedicated to sacrificing their lives for the cause.” Idrees detonated herself on January 27, 2002, killing 81 year-old Pinhas Takatli and wounding another 150 Israeli civilians. The article also highlights Hanadi Jaradat who murdered 21 people, including four children, when she exploded herself on October 4, 2003 in the Maxim restaurant in Haifa. The blood libel is an antisemitic accusation that became widespread in Europe during the Middle Ages. Its theme is “the Jews” ritually murder Christian children and use their blood to bake the Passover matzah (unleavened bread). These accusations often incited massacres of Jews, were used in Nazi propaganda, and now appear in Arab and Muslim media.